It was (I’m going to say, as usual…) drizzly as I approached the trailhead, but the idea was that I was hiking at the tail end of the weather, and since it was cool, I’d get the benefit of that without the chilling rain. I snapped a couple of shots of a couple of birds who were unknown to me (IDs to follow) and tried to capture a few cormorants floating in Freshwater Cove, but each took off before I could get a shot. The drizzle had basically stopped by the time I got going on the trail, but it was still a bit wet and muddy in spots. I remember passing a girl who was muddy up to her knees (and elbows) the last time we hiked this trail… I’m still puzzled as to how she managed that, even with the trail as wet as it was this time around! The story of the day was definitely the wildlife. After snapping the birds in Freshwater Cove, I saw a family of five loons at one of the coves along the 2-3km point of the trail; on the return trip I could hear them all calling at once. I took a break at one point and got a bit of a fright when a woodpecker started pecking the hollow tree right beside me (I didn’t know what the sound, echoing weirdly through the tree, was at first!). While I was unable to ID in person or from pics, he was pretty big, so my first guess would be a hairy woodpecker. He called to a mate in the distance so I’ll do some listening and update once I do the other bird IDs. I took the side trail to Fairmouth Cove to get a look at the Spout River waterfall, and on the way back up, I heard some splashing below. I thought perhaps an otter was dragging a fish out of the water based on the commotion, but when I looked down, I could see 4 or 5 seals sunning themselves on the rocks directly below me; I scanned the cove, and saw another group of ten, heads bobbing in the water. The splashing continued as the other seals sunning themselves followed suit, staring up at me, obviously the source of their consternation. I took a few quick pictures of this spectacle (outside of the ice near St. Anthony, where the seals are peppering the ice as far as the eye can see, I had never seen a gathering like this) , and headed back to the main trail. Just past this point I snapped a few pics of a rock lined with cormorants, and as I got to Spout River, a belted kingfisher flew directly overhead (I heard more than saw him, so no pic). So much wildlife! Berry report: Oh my goodness. The blueberries were very plentiful and very delicious. 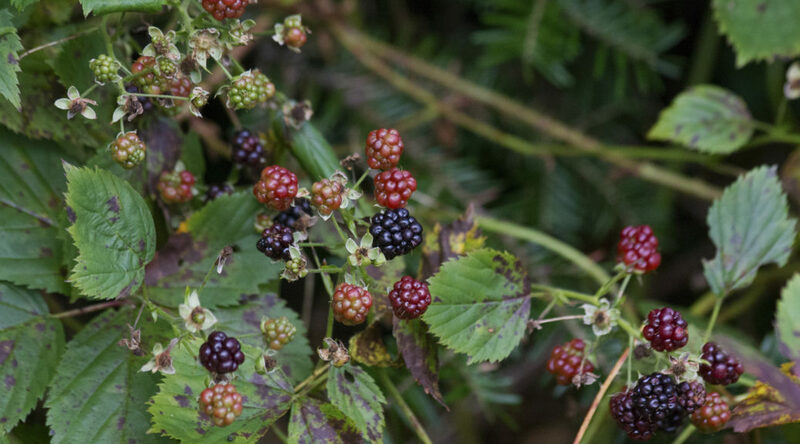 But at one point about a kilometer from the southern trailhead, there is a 2m patch of blackberries. Just ripening. Melt in your mouth delicious. I won’t be back this year so I’m okay with letting the secret out. Enjoy, hikers! Pics of all of this flora and fauna (with a little scenery, and another physics chat for the nerds among you) below! This little guy ran back and forth along the rocks in Freshwater Cove. ID to come. Shrouded in the mist, the Ferryland lighthouse, off in the distance. Three of the five loons I saw paddling around together. The falls of the Spout River as visible from Fairmouth Cove side trail. Some of the 15 or so seals bobbing in Fairmouth Cove. This guy was unimpressed with me. Some cormorants just chilling on the rocks in Fairmouth Cove. 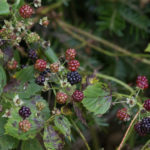 Sweet, sweet, delicious blackberries, how I love thee. For this physics lesson, I found some actual diffraction! Check out the next pic for some explanation. The wave fronts from the ocean crash on these rocks, and there’s a narrow channel through them. Most of the energy is dissipated by the rocks, but a little gets through. That little bit, upon exiting the channel, “spreads out…” applying Huygen’s principle, the red arrows show how the exit of the channel, treated as the source of the waves on the other side, give the curved waves we observe. (I probably could have gotten a better diffraction pic but it was getting cold). Hi folks! 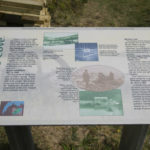 So last year, before the White Horse and Picco’s Ridge legs were added, I completed my lifetime thru-hike of the trail. With their addition, I felt like my thru-hike was now incomplete again and had to be finished. 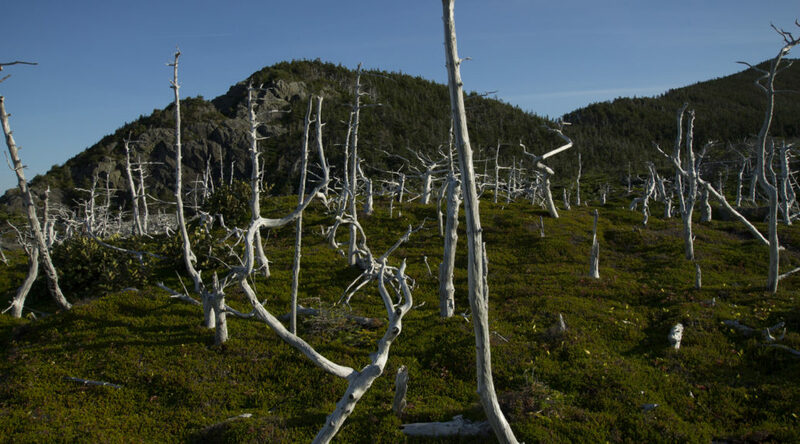 I had hiked White Horse back before it was officially added, but Picco’s Ridge had been intimidating me all summer with my lazy hiking schedule… I had myself convinced I wasn’t in good enough shape to get through it. After the last couple of weeks of hiking, I figured I had gotten myself as prepared as I was going to be, and vowing not to make any more excuses not to hike (inspired by my buddy Jim, out there on the trails after heart surgery! I have nothing to complain about), I bit the bullet and went for it. So glad that I did. What a spectacular trail. First off, hats off (way, way off) to the volunteers of the ECTA who have constructed and maintained this trail. It’s incredible, and you’ve done wonderful work, folks. For a trail that is “unfinished” or not hardened to ECTA standards, this thing is in great shape. Only for a kilometer or so around Ocean Pond did the trail feel at all overgrown, and nowhere was it confusing or badly marked (though I did manage to go the wrong way at Brock’s Pond Brook, completely missing the main trail: fortuitously, there were campers hanging out at the river watching the sunset who directed me to where my error occurred). I digress: the trail is in wonderful shape and all credit goes to the ECTA who have given us something incredible here, folks. A couple of quick pieces of advice if you’re planning on hiking this trail: one, be ready for climbs. Big climbs. This is true in both directions. The climb up over Black Cliff is no joke, and I bet the stairs on the other end are a rough way to start a hike as well. There are rope assisted climbs in a number of places (though none of them are quite as scary as the one above the starrigans on White Horse, IMHO). Get your boots on and get ready to scramble up over some hills! The second piece of advice: when a side trail is marked “viewpoint,” go see that viewpoint. 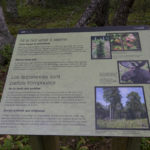 They are not to be missed on this trail. 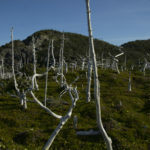 The trail is reminiscent of White Horse in that the elevation is just massive at points along the trail like Black Cliff, Picco’s Ridge, and Brock’s Head, but unlike White Horse there are lots of small climbs and descents over wooded trail. It’s a long 14.5 km for sure: it took me almost 6 hours to complete (bearing in mind that I took a few breaks, but also bearing in mind that after the sun set I basically ran the last three kilometers). The scenery is just unbelievable: whenever the trail breaks out and you get a look at the hills you’ve climbed or the ocean far, far below, it’s breathtaking. On the other side, the trail passes a number of ponds; there wasn’t a breath of wind on most, and they reflected the sky above like glass. Past Ocean Pond, the trail opens up to a barren where, as far as the eye can see in all directions, the world is all blueberries and partridgeberries. The next ten minutes of trail constitute one of the biggest blueberry patches I have ever seen, partridgeberries mixed between, all ripe and delicious (I ate my share). Anyhow, what a hike, what a day. Picco’s Ridge races to the top to be among my favorite sections of the ECT. Just a treasure. Check out a few of my pics below! The trail starts in beautiful Bauline. These little towns with their little roads, I love them. This is what a lot of this trail looks like, magical, little hills and mossy woods. Descending at the first rope-assisted climb! Looking back up at the first one. Climbing into the sunlight at the second rope-assisted climb. Top section of the second rope-assisted climb. This is what the climbs look like that aren’t rope-assisted. The second half of the third climb. It’s very difficult to convey using the camera just how massive the elevation is along this trail. A rope-assisted climb on Black Cliff. Capturing the moment of my accomplishment. The other side of the Black Cliff saddle. The viewpoint itself, one side of the rock halfway through it’s millennium-long plunge over the edge, is almost as awesome as the view. Walking through deadfall/starrigan is not nearly as confusing on this trail as it was on White Horse. One of the lovely ponds along the trail. Bell Island and the ocean far below. Inukshuks… hrrm. (I’d do a whole thing about violating Leave No Trace but let’s focus on open fires first I guess; and yes I know I’m a nerd). It’s in a nice location at any rate. This is what every bush for the next ten minutes of hiking looked like. Needless to say, I gorged on berries. There are some awesome erratics along this section of trail, especially as it approaches Portugal Cove. 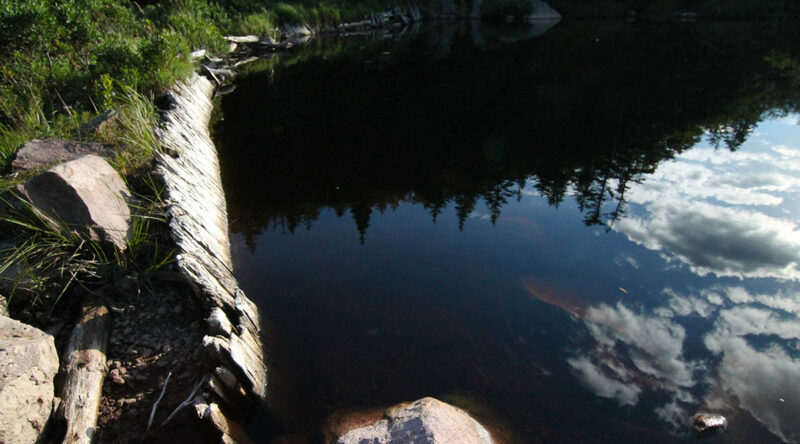 Brock’s Pond, a loon calling below, clouds like they were painted, what a spot for a break. A look down at Brock’s Pond From Brock’s Head. The sun was almost set as I passed the Blast Hole Ponds. Chest Cove is a wonderful place for a break. I got one of the trailhead at the end, at least! Today’s hike on Biscan Cove was definitely one for the ages. I was finished my afternoon session at work at a sensible hour, and having predicted that, packed my bag at lunch so I could scurry off to the trail. I vowed to power through the hike but saw lots of picture opportunities and explored new territory a little bit (which is incredible, given that I’ve hiked this trail about 20 times). While I didn’t get any pictures to prove my stories, I had three very cool wildlife experiences. There is an eagle nesting somewhere along the trail, probably two different nests actually, and I always see one south of White Point. 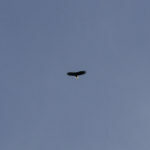 Of course on arriving at White Point I scan the trees to the south, and very close to me is Mr. Bald Eagle. I gingerly set down my pack, reach in, grab my zoom lens… and he takes off and is, in moments, gone around a cliffside. So close. 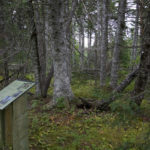 Next, walking out along the road to Cape St. Francis, I was humming to myself, when a bird of prey swooped low over the trees in front of me, across the road, and then down over the edge of the trees on the other side. I ran to see if I could catch a glimpse but couldn’t get another look. I barely saw anything, so there are a wide variety of birds it could have been (a downward-looking hawk or an owl?) but it was cool nonetheless. Finally, pulling out of the softball park (at which there was a softball game and half of Pouch Cove by the look of it), a GIGANTIC moose, full antlers, ran across the road about 10 feet to my right! He was quickly in the woods behind a house along the main road. Pretty wild. Anyhow, a few pics from today’s hike, with a little physics chat! Enjoy! A late afternoon hike on my fave! Sat down in my secret spot and saw this massive thing! That’s my hand for reference. It’s a great time of year for mushrooms. Thinking this is some kind of Bolete but I didn’t look too closely. The view north from an unofficial viewpoint. Looking back towards Pouch Cove. Freshwater River empties into the ocean. Have seen many eagles here. Initially I thought I was looking at waves diffracting into Biscan Cove, but it looks like it’s actually reflection. The ocean waves (solid black wavefronts on the top left of the picture) follow the red arrow in and impact on the headland that juts out into the mouth of the Cove. There are big crashes here as those waves impact on the edge of that headland. The second, curved wavefronts (red) appear to originate from that headland when we trace perpendicular lines (accounting for my perspective, bear in mind this is some MS Paint level physics and art) back from them. The ocean waves impacting on the headland are being reflected out from it, or at the very least, the crashing of the waves is creating new wavefronts that originate from that point as if it’s a point source of waves. Pretty cool. Will be showing my students. Cobbler Path – An Oldie but A Goodie! Way back when, Cobbler Path was my real intro to the ECT. When it was still about bird and whale watching for me, Heather and I would come out to Torbay Point on a regular basis. The scenery on the rest of the trail, as it turns out, is pretty much just as good, and it got me wanting to see the rest of the ECT. It was nice to get back out on this trail for the first time in a couple of years and see it all again! First stop, Torbay Point… as many times as I’ve hiked this trail, I’ve never been to the end, so that’s where I started the day. The sun was beating down and I walked down as far as the tip, checking out the massive rock formation at the end. What a spot for whale watching, by the way. The view of the coast in either direction from out there is just breathtaking. Heading in from Torbay Point, with the hot sun shining and no real schedule, the plan was to take my time, not put too much strain on my knees and my ankle (there are a few hills on this trail), and get some nice pictures. Took it slow, ate berries, enjoyed the weather and the views. By the time I got to Red Cliff, the sun was mostly obscured by clouds, which made the hiking even better, if not the pics. 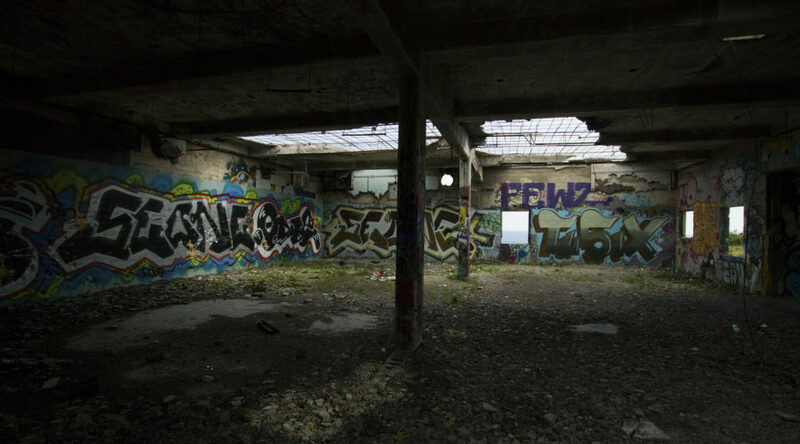 I focused on the graffiti at this point (gallery below). There was a lot of traffic on the trail today (hikers, dog walkers, berry pickers, etc.) which was really good to see. The views on this trail, despite its short length, compete with any other trail on the ECT in my humble opinion. Not to be missed are the aforementioned Torbay Point and the area around Cobbler’s Brook. Some pics below, discussion and pics beyond this gallery, too! Looking down at the end of Torbay Point. Now that is a trailside view. From atop the first climb, looking down at Torbay Point. The view of the coast to the south from Cobbler’s Brook. Looking north from Cobbler’s Brook. The character of the trail has definitely changed for the worse in this section. Nice mansions bys. The berrypicking near the mansions is pretty great! A look down from the abrupt end of the trail towards Sugarloaf Path, the Marine Lab, and that silly castle. When I got back to Torbay Point, I had to snap one more pic! What a spot. I didn’t want to include the graffiti in the trail pics because it was almost a separate focus for today. I really like graffiti, let me start with that. It’s art that straddles the line a lot of the time between vandalism and decoration/expression. I guess art is supposed to arouse emotions, even negative ones, so there’s that. For me, though, it’s a positive. The location is typically my only issue: I don’t like active businesses being tagged, or historical properties, for example. But the properties in question here are decrepit and unmaintained, and the art being created here improves the spaces IMHO. Had a chance to chat with a couple of artists who did some nice pieces today. Check out my gallery below! One of the pieces on the back of the most northerly group of buildings on Red Cliff. The interiors of the buildings are decrepit but striking. Side of the same building. Interior of same building, looking pretty incredible. A new piece. Very cool! Southerly building group. Again, a pretty awesome interior space with cool art. Some fresh, colorful pieces on the inside of one of the buildings. The interior of a building. These spaces are very cool. 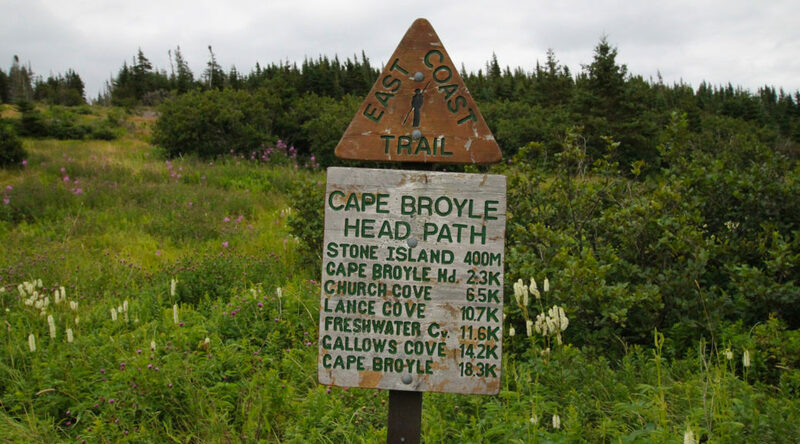 Cape Broyle Path – Always a Challenge! Hi folks! So these last few days of summer are all about me squeezing in my favorites, like I said… all of the hiking that I should have been doing in July and earlier in August. I couldn’t do a favorites list without Cape Broyle Path, which features my favorite place on the entire ECT: Lance Cove Beach. Just a treasure. I didn’t explore it for long this time around, but that just leaves more reason to go back again! First, let me say this: the treadway is incredible. The last time I hiked this trail, the first 10km of it were badly overgrown, to the point where I lost the trail a couple of times. Thanks to the ECTA volunteers who have put incredible work into clearing that mess, I don’t recall a single point on the trail where there’s a clear width of less than 5 ft. What a job they did, and the work must have been very hard: hats off. As I left St. John’s I still hadn’t arranged transportation from one trailhead to the other, but I was optimistic. I tried the two “cab companies” on the Southern Shore. Laughable quotes. At least the guy at Southern Shore Taxi was nice, explained himself, and let me know I’d likely find a ride if I was wearing a backpack anyhow. A+ Taxi and Tour, though, definitely get downgraded to an A-, at least, after quoting me $75 for the ten minute cab ride. Look, I know Cape Broyle is a ways away from Witless Bay where both cab companies are based, but you can get a regular cab fare in CBS, for example, which is pretty close to the same size if you’re talking Topsail to Seal Cove. $75 is enough for ten trips to Cape Broyle for goodness sake. You can’t call yourself a taxi if you’re charging people an arm and a leg just to come down the road… if I’m not paying what the meter says, you’re at best a tour company or car service, at worst, you’re preying on tourists. Anyhow, rant over, I gassed up and bought supplies at the Ultramar in Cape Broyle, and immediately found a ride when I asked around (thanks Danika!). Since my ride was leaving to head towards Calvert, I decided to hike the trail south to north, the opposite of last time. 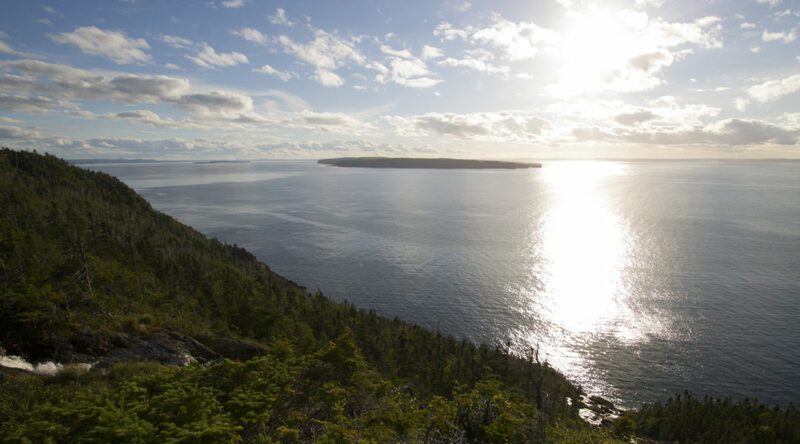 I think it was a great decision… it meant the long day was day 1, and it meant climbing Cape Broyle Head at the start of, rather than the end of, my hike. So, so much better. Pretty shocking thing to stumble upon. Still smelled like smoke. In places the trail acted like a firebreak. “Life finds a way,” as per Dr. Malcolm. Burned out right to the top of the hill. Could have been much worse by the look of things. IIRC, the supposed cause of the fire was a lightning strike. Scary stuff. However, think of these pictures when you’re lighting open fires along the trail… there’s a reason they’re not allowed, and this is it. Anyhow, Cape Broyle Head was as fun as ever, but despite that I made good time to Long Will. That said, my plan was to set up, head down to the beach, and hang out there as it got dark to do some astrophotography. All human plans are subject to ruthless revision by Nature, as they say, though, and the clouds prevented that from happening. I had my fire and my time sitting in the sand so it was all good. This morning was misty so I packed up the electronics, hence no pictures from day 2. The few times the sun peeked out weren’t enough to justify unpacking it. The only thing I saw that I really regret not catching on film was an immature bald eagle, perched on the rocks about 50 feet from the trail. It was pouring when I saw him so it wasn’t meant to be. A few pics below, I was hoping to get more on day 2 but them’s the breaks! Another grey day on the trail. Mushrooms have started to show up along the trail… no idea what this is (russula something or other maybe?) but it was a beauty. Passing over Blow Me Down, the crackerberries lined the trail. Shag Rock Cove, where the sun almost came out. A mature bald eagle perched on Shag Rocks. The viewpoint trail at Long Will has that “magical trail through the woods” feeling, though it peters out just past this point. I didn’t visit in daylight and didn’t want to backtrack so this is my only shot of Lance Cove Beach. Best place on the trail. My mediocre hang made for an incredible night’s sleep! Never again, tents! 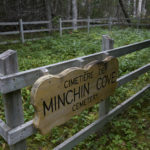 Silver Mine Head Path – Very Scenic! Hi folks! I feel like Silver Mine Head Path doesn’t get enough credit: more serious hikers may not want to hike such a short trail (at only 2.3km). But it does get a lot of day hiker traffic, given its location, and for good reason; the scenery is really spectacular, with cliffs and crashing waves along the length of the trail, not to mention Middle Cove Beach itself. Today was about saying I got out for a hike as much as anything, since I had a busy day but didn’t want to skimp on the hiking with the weather like it was and the summer winding down. I had a spectacular day weather-wise: sunny, bright, not too hot. Things were looking great, until I got to the beach and started packing up my gear, and realized I had (boneheadedly) forgotten my camera… so it’s potato camera pics this time around. The weather was so nice that even my potato camera was good enough for a few decent pics. Well, sort of decent… I don’t know how to work my phone. It’s alien technology. I passed a lot of young kids on the trail today… this is a perfect little hike for a family for sure! Great to see kids out enjoying nature too! A few pics below. Enjoy! A short but very scenic trail. The graffiti on this sewage outfall is pretty cool. So boneheaded, leaving the camera home on a day like this. Motion River is a cool spot. Fun to cross. Watch it after a lot of rain though! Another one of Motion River. Some of the cliffs close to the north end of the trail. Middle Cove Beach is a nice spot. 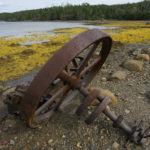 Deadman’s Bay Path, Part 2! Well, if you’re going to make serious crack at getting some trails knocked off in the last week or two of the summer, you’re going to need to hike some consecutive days. I kept hearing “chance of showers,” which doesn’t sound so bad, and I do have rain gear, after all, so I figured I’d head out and complete Deadman’s Bay Path the day after part 1. Didn’t need the rain gear and got a nice, cool, cloudy day for a reward! Not much for scenery shots, but great for hiking! I got to Blackhead and it was pretty grey, and so I decided to focus on making good time as opposed to taking snaps. Ended up taking more than yesterday, I think. Anyhow, I saw a few interesting birds and this time had my zoom lens. Took a couple of the barachois as well, one of my favorite places. Too bad the folks who like to party there don’t keep it a bit cleaner (to be fair, at least the garbage has been gathered in one place…). Anyhow, a few pics below! A gray day on the path. A pair of cormorants on Peggy’s Leg. So these are obviously not partridgeberries given my positive ID of those the other day. What are these? I’m going to guess gooseberries but that’s pretty much a random guess! …and that this guy is a juvenile common sandpiper. Not a bad spot to set up for the night. This was hanging at the south end of the barachois. Yeah, no thanks. 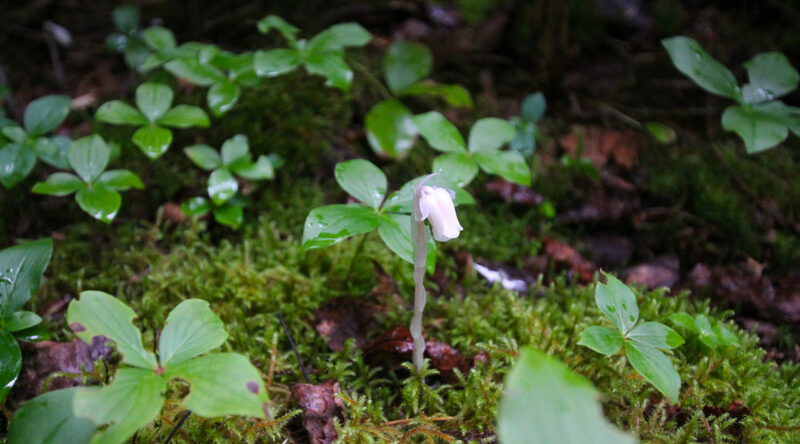 So as it turns out Indian pipe is indeed a fine name for this beautiful little plant. At Small Point: good advice, especially for solo hikers. Here’s Small Point from the side. The sign is in the upper left hand part of the picture. If you had any doubts about the veracity of the sign’s claim. This stuff, I love it. Beautiful. 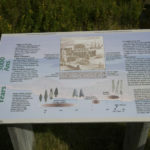 Deadman’s Bay Path, Part 1! Hi folks! I’m making an attempt to squeeze in as many of the good trails as I can with the summer winding down, and so my plan for today was Deadman’s Bay Path. 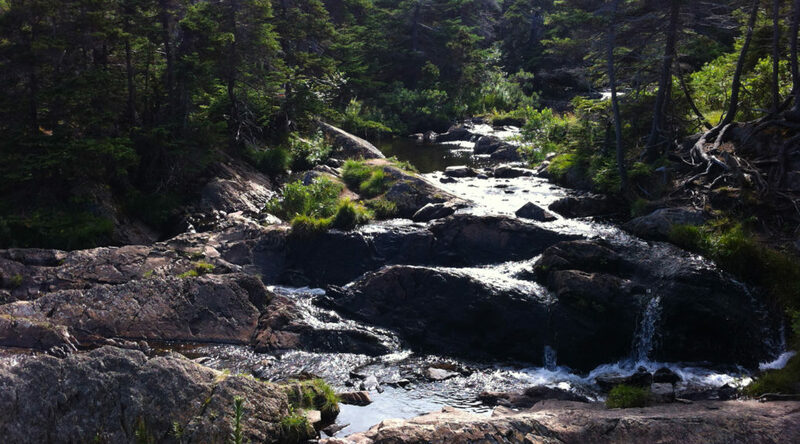 I had only hiked the trail once before and always meant to make my way back to Freshwater; it’s an incredible spot. I couldn’t find transportation from one trailhead to the other, and didn’t really want to cab it, so I came up with a plan: Fort Amherst to Freshwater Bay (and back) today, and Blackhead to Freshwater Bay (and back) next time! It was a hot one on the trail but luckily enough the sun spent some time behind the clouds. It was a “hot in the shade” type of hike, though, so there wasn’t much to be done other than sweat my way through it. The climb out of Fort Amherst is just as much fun as I remember it from my late fall hike, and the heat made it just a touch more fun. Once on top of the South Side Hills, the going was pretty smooth. This is a beautiful hike but I decided I’d power through it , hoping for better photography on the way back, and was lucky enough to be right. I did make numerous short stops for berries… the blueberries were largely ripe on the open top of the Hills, and there were ripe partridgeberries (thanks Dana!) mixed in here and there. 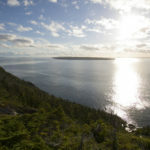 I decided once I got to Freshwater to check out the side trail to Gunners Cove, a side trail I hadn’t explored on my one trip over this trail. There was a nice viewpoint at the end and the path through the woods was very pretty. I was sad to see the evidence of multiple open fires, including a pretty large fire pit, frying pan hanging in the trees. Just why. 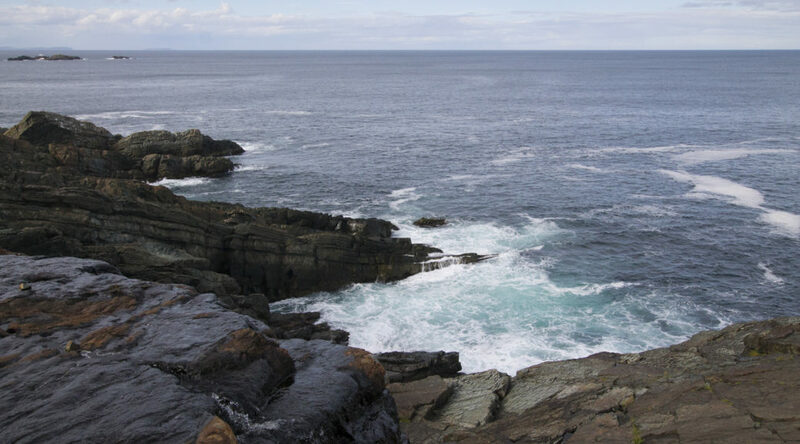 At the end of the Gunners Cove Path, there are two pits quite literally visible from one another. I just don’t get people. Anyhow, the sun came out as I got ready to leave Gunners Cove and made for some nice photographic opportunities on the walk back… score! Check out some of the pics below! It was much colder last time I took this pic. a “disused cistern” according to the ECTA map. 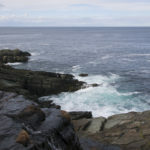 The view from the end of the Gunners Cove side trail at Freshwater. Looking across Freshwater Bay at Small Point. There’s something magical about a trail through the woods, leaves on the forest floor, the sun shining through the gaps in the branches. Saw a few of these interesting lichen(?) in circular patterns on the exposed bedrock along the South Side Hills. Reminds me of the fairy rings that mushrooms sometimes grow in. 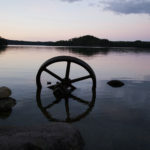 Loved the sky reflected in the still waters at Soldiers’ Pond; the decaying dam holding back the water. Another look at Soldiers’ Pond, and at an erratic above it. The city and Signal Hill from the other side. 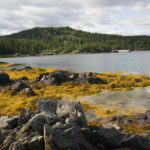 An Afternoon on Brigus Head Path! Hi folks! It’s been a while. I’ve had a busier summer than I anticipated and there always seemed to be some excuse to not hike. Not good, but that’s the situation. So this won’t be a summer of big accomplishments on the trail, but I figure I’ll go hard for the rest of the month and see a few of my favorites, at least. Starting with Brigus Head Path, a nice little 8km loop! There wasn’t much of a crowd on the trail, and the weather was great for hiking, cool and cloudy, with a bit of a breeze. I made my way pretty quickly around Brigus Head and came back over the old Southern Shore Highway. 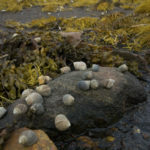 Because it was a grey day, it wasn’t a great day for my regular scenery/landscape pics, but the beauty on the ECT trail isn’t just in the cliffs and shoreline; the flora and fauna along the length of the ECT is truly beautiful. Without my zoom lens (note to self: gotta take the zoom lens on day hikes), I couldn’t capture the birds I saw, but I did see a cormorant in Timber Cove (same location as last year, if I recall correctly), a couple of loons at Bill’s Tar Cove, and nuthatches and other little birds aplenty along the old track back. So today’s focus was on flora. And by flora I mean the berries that are just starting to ripen and were delicious. Though I suppose if you count the dogs who were waiting at the trailhead when I got back, there was some fauna. That said, I did snap a couple of my favorites, ie. good old Hare’s Ears and the aforementioned Bill’s Tar Cove… I don’t know who Bill is but his cove is one of the best little spots along the trail. 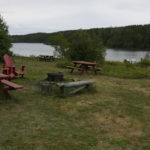 For the blueberry hunters, BTW, the hill on the south end of the Southern Shore highway, ie. closest to Admiral’s Cove, is covered, and they’re riper up there than elsewhere on the trail for sure! Berries as far as the eye can see! Such an awesome time of year to hike the trail: everything is so lush. What are these things? There was a big patch by Hare’s Ears. I feel like I should know. Partridgeberries? 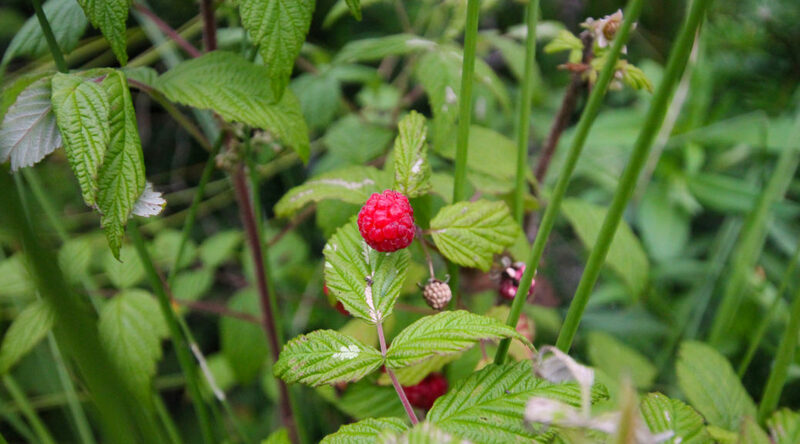 A few ripe raspberries around as well. Yum. “Indian Pipe” which probably has a more racially sensitive real name. The sun almost gave me enough for a landscape shot from time to time. Got a bit of shimmering at a viewpoint and had to snap. Good old Bill’s Tar Cove beach. What a spot. I feel like I always forget to take this pic for the sake of blog visitors who might be confused by the intersection of the trail and the old Southern Shore Highway. Lots of berries just up over the hill! Some more of the aforementioned blueberries! The greeting committee in Brigus South.